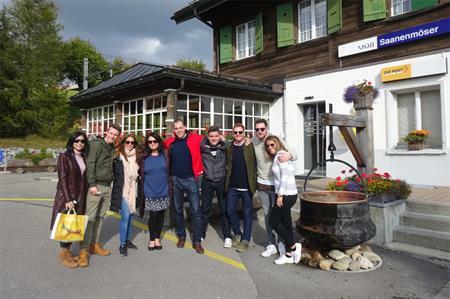 C&IT A Listers from agencies including drp, Top Banana, Capita Travel and Events and MD Events travelled with C&IT to Switzerland for a three-day trip across two destinations. The group was hosted by C&IT A List destination partner Swiss Convention and Incentive Bureau, with an itinerary from Bern Tourism and Gstaad Tourism. The group arrived in Zurich last Friday (7 October), transferring to the capital Bern via train. The trip began with lunch at the Granary Café – the Kornhauscafe, in the middle of Bern on Granary Square, next to the impressive City Theatre, followed by a visit to the Kornhauskeller, a cellar restaurant beneath vaulted frescoed arches. After lunch, the group enjoyed a walking tour of the Old Town of Bern, a Unesco World Heritage site, stopping at sights including the Clock Tower, Albert Einstein’s house, where the scientist developed the theory of relativity and the Cathedral of Bern, Switzerland’s largest ecclesiastical building which also houses the country’s highest church tower. The group enjoyed a tasting at Vom Fass, with a range of whiskies, grappas, oil and vinegars drawn straight from casks, with the evening rounded off with an Italian-themed dinner at Lorenzini restaurant. On the following morning (8 October), the A Listers visited the Zentrum Paul Klee museum, designed by Renzo Piano, for a hands-on art workshop creating paintings in the style of Klee. In the afternoon, the group left the capital by train and headed to the chalet village of Gstaad, taking part in a treasure hunt competition in the resort’s centre. In the evening the group enjoyed a wine tasting in the wine cellar at Wellness & Spa Ermitage Hotel, followed by a game and cheese-themed dinner. On the last day (9 October), the group took a 20-minute drive to Les Diablerets, the gateway to Glacier 3000. Two cable car rides later, the group arrived on the glacier and took the exhilarating Peak Walk by Tissot, crossing a 107-metre long and 80-centimetre wide suspension bridge connecting two peaks – the only one in the world, with stunning views of the Alps, including Matterhorn, Mont Blanc Massif, Eiger, Mönch and Jungfrau. The tour ended with a ride on the Ice Express chairlift. During the trip, the group stayed at the Belleville Palace Bern and the Golfhotel Les Hauts de Gstaad.